In order to function properly, the larynx, tongue, and jaw must hang freely from the skull without upsetting the balance of the head on the spine. When we are able to maintain the length and support of this larger system, the throat remains open and the muscles that act upon the larynx can work freely. In tenors with pillar-like necks, for example, the neck and throat muscles are naturally well-developed and provide a stable support for the larynx. The throat is open and free, and the larynx can be actively engaged during the athletic activity of singing without any sense of effort or strain. Over time, however, many of us use the voice in such a way that we collapse and tighten the throat. 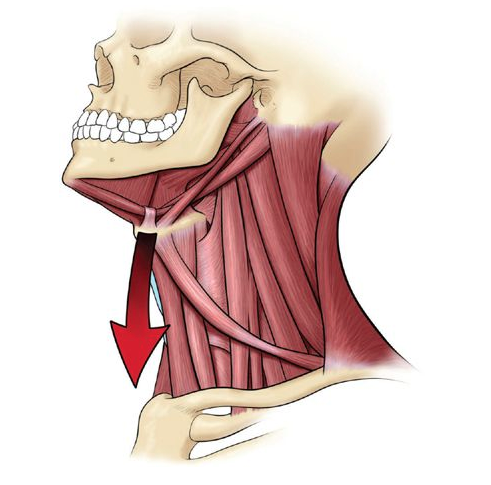 The musculature of the throat becomes constricted and the larynx is pulled downward by the tugging of muscles that are overworked. This creates a drag on the skull and the upper spinal column and compromises the length of the trunk, thus interfering with the upright support system. A number of factors contribute to the tightening of the throat muscles, but perhaps the main one is harmful habits of speech. People who use the voice in a heavy, enervated manner tend to collapse the musculature of the throat, resulting in a hoarse, throaty tone of voice; prolonged speaking in this way can have a depressive and devitalizing effect on the entire system. Professional speakers and singers often develop harmful patterns of tension in the muscles of the neck and ribs, habitually tensing the throat muscles and gasping for air between phrases. Dimon Jr, Theodore. The Body in Motion: Its Evolution and Design. North Atlantic Books, 2011.